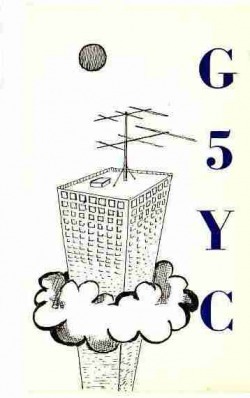 The Imperial College Amateur Radio Society (HAMSOC) folded in 2001, leaving it's callsign, G5YC, without a home. Being rather nostalgic, I decided to become custodian of the call should HAMSOC ever reform. As I was paying for the call every year, I decided to use it as my HF call in 2006 as it is so much shorter than M0BPQ in cw contests. I was only a member of the society for two years before it folded, so I know little of the its history. There was an RSGB certificate on the wall of the shack in the Beit Quad dated 1924, so clearly the club had some heritage. There was also an impressive antenna stack on the Electrical Engineering building which was never in use whilst I was a member. I am trying to get a meeting with the college archivist to see if information and logs are available, and if I do I will post the information on this website. If you have any information of the amateur radio society from your time at Imperial College, please contact me as it will be gratefully received. "Hello Steve I've been wondering why all mention of amateur radio had disappeared from ic.ac.uk- my guess that it had folded was unfortunately correct. I can't tell you much about anything recent (ie since 1974 when I graduated) but I can offer a little information about the 1971 - 1974 period. Things were quite active then- in summer 1972 we went on a return visit to Andorra as C31FK (C31DZ was a year or so before)- the trip being notable for a tremendous thunderstorm at pic de la rabassa (I think) the last night we were there. Luckily it was after we had dropped the masts but we still spent most of the night huddled in the Land Rover- no-one fancied their chances in a tent! In 1972, the new (24ft x 12ft timber building) shack was being commissioned on the roof of the Elec Eng block, replacing a smaller (about 12 by 8) one between the lift motor house and the boiler chimney which was almost uninhabitable if the wind was in the wrong direction. The same fumes had had dire effects on the chassis of the KW2000 HF rig over the years. Luckily the Swan 2000 linear was newer and less decayed. Aerials then were a 3-element monoband yagi for 20m plus a 3-element trapped yagi for 15m and 10m above mounted on about 20ft versatower. A separate scaffold pole (ISTR) carried a 14 element parabeam for 2m. 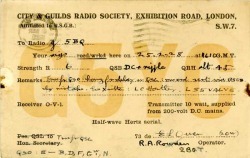 Other HF bands made do with long wires of one sort or another. The KW was replaced by a Drake TR4 in 1973 ish and 2m was taken care of by an Emsac TX2 (about 10W series gate modulated AM with about 5 spot frequencies multiplied up from 8 meg crystals) plus a Microwave Modules converter into an AR88 on 4-6 megs. Life was enlivened by such exploits as hanging a 6ft fluorescent tube under the boom of the 2m beam to provide interesting flashing lights in the sky and pointing the big HF array at Linstead at about 7dBL plus antenna gain to see how long it took someone to moan about RFI. Mostly though we behaved ourselves (as students do ;-) . I ended up as chairman for 1973-74 if for no better reason than it guaranteed me a tankard (RCC24) in the union bar unless some scumbag previous chairman turned up and claimed precedence! I think the tankard was lost sometime in the 80's - at least the one with my name on it was :-( . Some things you might know- was the VHF callsign G8EYC carried on by anyone? Any idea when (why?) the shack moved to Beit? It used to be quite impressive claiming a 14 ele beam at 200 ft AGL in central London. 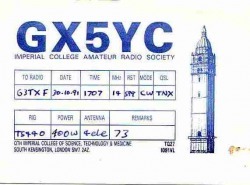 73's Chris Byard (ex G8GVO)"
I saw your website and mention of the G5YC callsign (later GX5YC). I was treasurer and then chairman of "HamSoc" back in the early-mid 90's. I was also responsible for putting the antennas on top of the Elec Eng building, which were used regularly at the time. What happened to the club? And how did you come to be the owner of G5YC? I'd be interested to hear. Thanks for the reply and sorry for not getting back to you sooner. It's a shame to hear that HamSoc has finished and it sounds unlikely that it will re-start from what you said. The club had probably been in decline for about 10 years, so it isn't a big surprise. They actually had most of the gear stolen in the late 80's, but we managed to gradually build up a decent amount of equipment again. By the time I left, we had the cable to Elec Eng running, a nice beam on top and a decent rig/amp set up which worked really well. Do you get much interest when you use G5YC? I always found that people were interested and wanted to know why we had such an unusual call sign. We often had a bit of competition with the science museum (GB2SM) next door, but the extra height on the antennas meant we could usually put out a better signal than them! I have lots of good memories of my time with hamsoc, and remember many hours on the roof of elec eng fixing something or other (usually re-attaching part of an antenna that was blown off in the wind). We also had a trip with the estates manager to inspect the entire length of the heliax cable at one point, which was fun. I'm not active in radio these days. Getting a decent amount of kit an somewhere to mount an antenna put me off, and email is still easier than SSB! All the best, Matt"
relatively little that I know about it all. up the various bars during my first couple of years at IC). to control the preamp and Microwave Modules 100W PA up on the roof. allowed access at all sorts of hours. low and the Union officers were not very sympathetic. (needed in Central London) was not too good either. licence holder for the club ever being about. My friend Graham (g4lxt) pointed out your site to me today, we were students there in the early 1980s (1980-83 in my case) and members of Hamsoc, and I was president in my second year. At that time it was an active society, it was at the height of interest in radio, CB was about to be introduced and with the sunspots at a high there was lots of activity. I remember being taken by a fellow ham to see an illegal CB operation in the room of his halls nearby. There were two dxpeditions whilst I was there, one to Andorra and a second to the Faroe Islands, I went on the latter and have memories of our camp being nearly blown away by the strong winds. The society had an active shack, we replaced the rig whilst I was there spending some £5-600 on a pretty top range model, we also had a big linear going and it was pretty easy to work what you wanted, I was a new ham and one of my first contacts was VQ9JS, I didnt have any idea what I was working at the time. The IC2E was introduced whilst we were there and that was the rig to have, we all thought it amazing that something that size could have all those facilities. Also the FT290 must have been around towards the end of our time there. We entered a few competitions, with the vhf aerial on top of the tower we had a killer signal out of London and did well, there was also an active speaker programme and a usually decent turn out. We also helped the motor sports soc with their night rallies providing comms support. There was a very active vhf net going amongst the students and 'young people' in south London, I think we used 145.725, might be wrong! Mainly with our handhelds. Some new bands were made available to hams in that time 10MHz for instance, Graham and I took the college rig down to his parents' house in Seaford to work the band the day it opened, in the process demonstrating how bad our morse was. There was a ambitious project to run a very low loss cable to connect the rig in Beit Quad (??) to the top of the tower, we pulled the cable through the tunnels under the college, I am not sure anything ever got connected up though. Somewhere I have a photo or two of me playing with aerials at the top of the tower, there were photos taken on the trip to the Faroes, I think we wrote that up in Radcomm, I remember the 2m yagi being bent by the wind. Was good fun, an active group, shame the callsign isnt used now, as a young student it was good to go on the air using that callsign, it was unusual and people often thought we ought to be about 70 or 80 to have a callsign so old! After searching the remnants of my brain, (I will turn 85 on October the first), I must confess that my memory of my experience with G5YC is rather sketchy. But here goes, anyway. First a word about my Ham background. I was first licensed in the late 1940's, as VE3BTG, and quickly became a DX addict. I built a 500 watt amplifier in my teens, and worked 123 countries while in high school. I entered Queen's University in Kingston Ontario, taking Engineering Physics, where I spent almost too much time operating the Amateur Radio club station,VE3VX, and helping with the University AM radio station, CFRC. Incidentally, CFRC's first broadcast was on October 24, 1922, six days after the founding of your BBC, which claims to be the oldest national broadcasting organization in the world! After graduation and working for a few years, I snared an Athlone fellowship for study in the UK. In September 1958 I spent a week of sea-sickness on the old Empress of France, finally arriving in Liverpool. (Just to show my broad cultural interest in foreign travel at that time, I must confess that my most vivid recollection of views from the train on the way to London was the large number of vertically-polarized TV antennas/aerials. We used horizontal polarisation/polarization in Canada. Note that by now I was becoming bilingual). At Imperial College I was amazed at the number of extra-curricular activities available to students. I attended introductory meetings of the golf and gliding clubs. I joined the former, which played at the Highgate golf course. I remember that membership at Highgate G.C. for I.C. students was the grand sum of 2 pounds. And again, I spent almost too much time extracurricularly, (I hate people who invent words like this! ), playing golf that year. At the time I had a room on the fourth floor of Beit Hall, one of only three or four student rooms on this level. During an exploration excursion I discovered an unlocked access to the roof. (I don't remember if it was stairs or a lift/elevator). There was a small shack, which appeared to be unused, at the western end, I believe. I mentioned this to David, and after a number of inquiries he learned that the appropriate College authorities would be very pleased to see an Amateur Radio club re-activated. He also talked them into giving us a small grant - I believe it was only 20 pounds, which sounds pretty trivial by today's standards, although it represented a month's wages for bus drivers and conductors, according to posters I saw on buses. He also found that we could request permission to use the shack on the roof by applying to the Clerk to the Governors (which sounded to me like "Clark to the Governess", until I saw it in writing. ( I find it amazing how I remember insignificant little details like this, but not the really more interesting or important ones. Anyway, we used the grant to purchase a few tools, including a hammer and saw, which we used to build a work bench and operating table. We also bought the necessary 2x4's, planks, etc., which I was surprised to find was called "timber" in the British dialect, rather than "lumber", in proper Canadian English. Apparently "lumber" is something completely different over there, as I was told by the wood dealer, to my embarassment. In Canada "timber" is un-cut logs, as fed to a sawmill. (Other similarly problematic words are corn, fir (as in tree), and hockey). 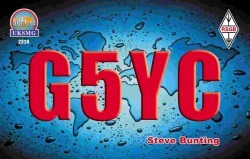 We finally got on the air with G5YC. I don't remember what we used for a receiver or transmitter. There was no such thing as a transceiver in those day. Our grant didn't allow for a store-bought antenna. No problem. The sunspot cycle in those days was near its peak, and it was a great one. Ten meters was wide open every day. We had a "long" wire for 20m. and the "new" 15m. band. For 10m we built a 2-element wire yagi, mounted on 2x2 timbers and fed with 300 ohm ribbon line. It couldn't be rotated, so I shortened the reflector to resonance, and ran an additional feed line from the center of the reflector to the shack where it was connected to a parallel L-C circuit which could be tuned above or below resonance, depending on whether a director or reflector was needed. This would shift the directivity of the antenna 180 degrees. It worked beautifully. Being able to fine tune the parasitic element allowed us to reduce signals from the back almost into the noise. There were really only the two of us who operated the station. There were two or three others who attended our infrequent club meetings. They were not really active, but were welcomed to give the appearance of greater activity. It was a bit surprising that there was not more interest in a student body of the size of I.C. However, as I said, there were a great number of student clubs and organizations competing for their interest. We worked quite a bit of DX that winter. As far as I remember, it was all on phone, no CW even though that was my favorite mode. There was very little, if any, regulation or monitoring of our activities by College authorities. I don't remember keeping a log, although I expect we did, since that was a law in most countries. Also, I don't remember having to show proof that I had a license in my home country. The following year I had to move out of Beit Hall, since it was difficult to get a second year in residence. I now lived some distance away, (West Kensington), and had little reason to visit the students union, or wander around the residence or the roof. David had completed his Masters degree and moved out of the London area. To cap it all off, our "tunable yagi" blew down in a winter storm. By this time I had "other interests", and heard no news of Amateur Radio at I.C. for the remainder of my stay in London. Epilogue: Completed my PhD, married an English girl, returned to Canada. Spend the better part of 30 years in a government research lab helping to design the Alouette and CTS satellites, publishing forty-odd research papers on radiation effects on gallium arsenide materials and devices. Retired 20 years ago, and bought a house with 28 acres about 30 km from downtown Ottawal. Returned to Ham Radio with the call VE3QAA. Worked over 330 countries (all bands) , but never heard a station signing G5YC. (Now working only Top Band (1.8 MHz), with 253 countries confirmed. Building an amplifier with a pair of Russian GU-84B's, capable of 5 KW out. (My "bucket project" - hope if finish it before kicking).